A quick and easy yet healthy and flavorful dish for lunch or dinner. This buttery dill mustard baked salmon is paleo and Whole30 friendly and ready in less than 15 minutes! I ride solo with my salmon and I’m perfectly fine doing it that way. I wasn’t always though. I swear I didn’t sit down for this recipe planning to dig into my best relationship advice, but it’s happening so let’s go with it. I ride/fly solo with my salmon because Adam flipping hates salmon, and I now accept and respect that fact that I just couldn’t for so many years. I tried to cook it probably 10 different ways, all delicious in my opinion, and each time it would go to waste. Literally – I saw him throw the whole thing in the garbage once years back, and, I might as well have caught him in the act of, er, something else, because the image of the salmon hitting the trash will never be erased from my mind. Okay fine, that’s an exaggeration, except that I totally remember what he was wearing when it happened (Adam, not the salmon.) And what I was wearing. And I can even see the pile of mail sitting on the kitchen table witnessing the whole thing. Wow, did I just go off on a tangent or what? Where was I? Ah yes. Don’t try to make people (especially a significant other) like a food that they just don’t like. Not only will it not work, but they’ll start to want to kill you which is bad news for nearly any relationship. Plus you waste a whole sh*t ton of awesome food. Be flexible, be accepting. You are not that person’s food parole officer or the authority on anything regarding their choices, preferences, and quirks. Yes, I made the salmon issue into a power struggle and it was stupid, and a damn good salmon fillet (probably more than one but I was kept in the dark) was sacrificed in this war. It’s just not worth it. Make solo salmon, not war. All that to explain why the recipe I’m about to give you is a single serving. But please, don’t hesitate to double it if both you and your significant other are truly happy eating salmon. That’s a beautiful thing to cherish. So you just go and eat your salmon frolicking in a field holding hands while I make mine to each alone for lunch in front of the computer. I’d take the latter over the former any day anyway, I’m really not much of a frolicker. Wild caught salmon fillet baked in a creamy sauce of ghee, lemon, mustard and dill. Gluten free, dairy free, soy free, clean ingredients, and ready in 10 minutes! 1 6 oz wild caught salmon fillet or 2 if you plan to double! 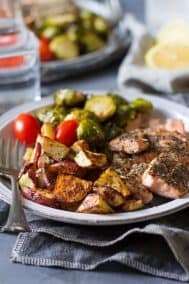 Place the salmon in a greased cast iron pan skin side down (or on an aluminum foil covered baking sheet for less cleanup) and sprinkle the top with the sea salt and pepper. Then spread the dill mixture evenly over the top to completely coat. Serve with whatever you want (it's your salmon after all) and enjoy! What’s your favorite thing to cook for just yourself? Have you tried to get your significant other to like a food that just wouldn’t happen? Best relationship advice salmon related or not? I made salmon the other night with a maple Dijon marinade! I don’t really like salmon but I tasted it to make sure it was acceptable and I must admit, it was really good! After reading this I feel really blessed that my hubby likes salmon! In fact I think David would like it if we had fish more often than we do! I don’t blame you for trying, even in my head I am thinking ‘gosh there must be some way he will enjoy salmon’! Haha! I love halibut too! Really all fish has become a lunch thing for me, or the odd night where Adam’s out and I tell the kids they’re having hotdogs 🙂 Can’t wait until at least one of my kids likes fish! I’ll have to start with Diana. Smoked salmon is delicious too and I don’t have it enough. Salmon is my favorite thing to cook for myself! I do it often. My go-to is something with honey mustard but my mom actually made a lemon-dill salmon the other night! So good and summery. I am so thankful I’m not married because I don’t think I could handle it if he didn’t like salmon. Ok that’s an exaggeration but you get what I mean. Great recipe! Haha, I hear you 😉 It’s a good lesson in “letting go” I guess, I don’t have energy to fight over food anymore! 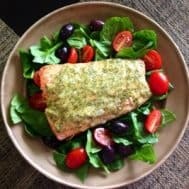 I was laughing through this blog because my husband is the SAME way and salmon is a no go and always has been. I just wouldn’t accept it. Made great wild salmon for years forcing him, but he had the last laugh. Isn’t it funny how we remember the clothes we wear and the mail of course with a guy is always involved on the table when we are wronged lol. Now I go solo all the time. I need to for my gut. He could eat a tank and be well and me everythings a problem when I venture out into unallowed territory. Have a great weekend. You always keep me laughing. Same with us! So funny how many similarities we have 🙂 Enjoy the weekend! My husband hates all fish so Im always making it just for me…this looks great. I’ve learned to look at it as more for me, the stuff is $$ after all! I didn’t like salmon until about 5 years ago but now Rob and I both eat it so its a weekly staple in our house! But I make it the same way every time…this looks like a great recipe to change things up! I need to pick up some dill ASAP…it seems to be in every recipe I want to try out this week! Thanks for the delicious recipe. Salmon is my favorite fish and I’m always looking for new ways to eat it! Happy Friday! I love to cook myself meatless tacos! So yummy : ) And I have desperately tried to get my boyfriend to love asparagus as much as I do but he wants no part of it haha. I have a recipe for a lemon asparagus pasta next week… maybe he’ll give it another shot ! Haha let me know how it goes with the pasta! I love this story because it makes me feel like I’m not crazy 😉 Seriously though, it’s a good lesson to learn! I think we all face something like this at some point in a relationship! But I ALWAYS top my salmon this way (kinda!) Either dijon or honey mustard…but always mustard and DILL! Dill is salmon’s child herb! I agree mustard just goes so well with salmon. I do a maple mustard version too that’s delicious 🙂 And dill is just the best! I need to join your solo salmon club. 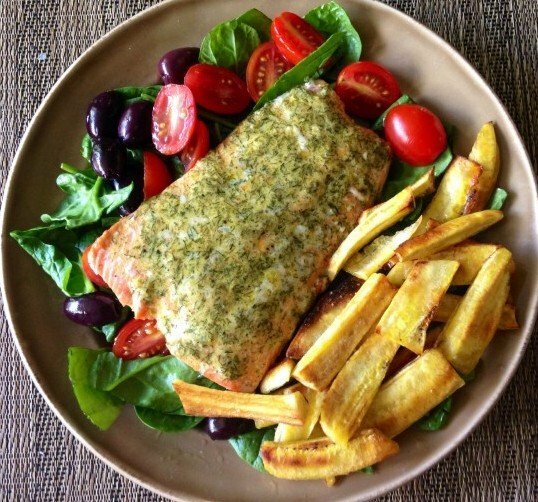 I LOVE salmon and this recipe looks amazing! Thanks! Of course you’re welcome to join 😉 Hope you like it! I’m good with salmon just as it is, too. My family likes some variety, though, so I try to change it up. I love to poach it in a combo of white wine/olive oil. Looking forward to trying this one! We love salmon in our house! I will definitely give this a try! Oh this looks marvelous, simple and delicioius. My husband would defnintely like this as he is a major salmon lover. The main things I can’t get my husband to eat are red meats and bacon, and don’t really try since I think it’s more about his beliefs. He also said it’s for health reasons but his cholestoral is much higher now than ever, so don’t get me started lol. His diet of cheese and pizza is not exactly blooming with health, but I try to be an example as I overhaul my own eating habits. Omg Michele, this was probs the funniest post you’ve ever written! I’m sad that you had to witness Adam losing his master of the salmon domain, but thankfully you were able to replace the memories with yummy salmon recipes. I love mustard baked chicken… I have to try it with salmon! well you know I love this, and all it’s delicious buttery salmon goodness! dill is my FAV!!! It’s the best, goes with so many dishes! This sounds amazing on salmon! yum! Hi there, does the skin go crispy when you cook it this way? No, sorry no crispy skin! I do love my crispy skin when I fry it though. This Salmon was so good and so flavorful. Probably one of my favorite Whole30 compliant meals to date. I’ll definitely be making this again. This was AMAZING! My new favorite way to prepare salmon. 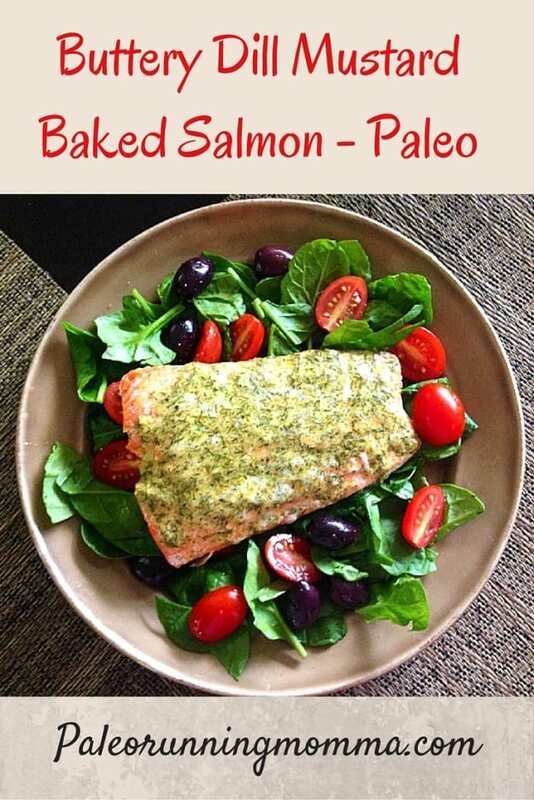 This is my go-to salmon recipe! I’ve made this countless times in the last year. 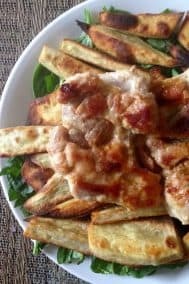 I always have the ingredients on hand, it’s quick, simple and fast! Love it. Thank you! This was soooo good! I have to bake it for about 20 min though… Maybe because I’m at 7000ft .